Warner University Coach Sean Hanrahan and his wife have been visiting the territory for eight years. His school’s basketball team that once featured local players Ray Victor and Halstead “J.R.” Chiverton made its third appearance in the BVI Tropical Shootout Classic for a third time. When they returned to Florida over the weekend, the Royals walked off with their second title to match the one earned in 2012, following their 16-points 88-62 triumph over the Montreat College (N.C.) Cavaliers on Friday night, despite a three points loss to BVI Basketball Federation champions Legs during Saturday night’s exhibition game at the Multipurpose Sports Complex. With the victory over Montreat, the Royals improved to 7-0 on the season. Montreat then succumbed to the Northwood University Seahawks, 75-65 on Saturday evening, falling to 3-4 while the Northwood improved to 3-0. Northwood was scheduled to play the University of the Virgin Islands in its opening game Friday but they pulled out of the tournament and they held an intra squad matchup. In 29 minutes, Warner’s Warren Hall had a game high 27 points on 10 of 13 from the field and a game best four steals in the victory over Montreat, who led 43-29 at half time. Leading rebounder and tournament MVP Eddie Delegal had his third double double of the young season with 21 points and 11 boards. Jamie Anderson and Baldimyr Santiago contributed eight points respectively with Anderson collecting a team high five assists. Montreat’s Joshua Foster was their leading scorer with 13 points. Angel Lopez, Cedric Cash and Myles Marshall all came off the bench to join starter Melvin Irvin in scoring seven points respectively. In Northwood’s 10-points 75-65 victory over Montreat who were up by 15 at one point, they out rebounded Montreat 34-32, picking up 19 points off assists. 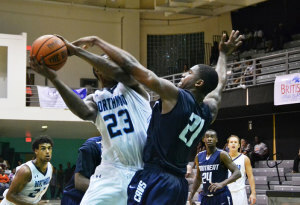 Their defense also forced Montreats into making 23 turnovers off which they scored 18 points. 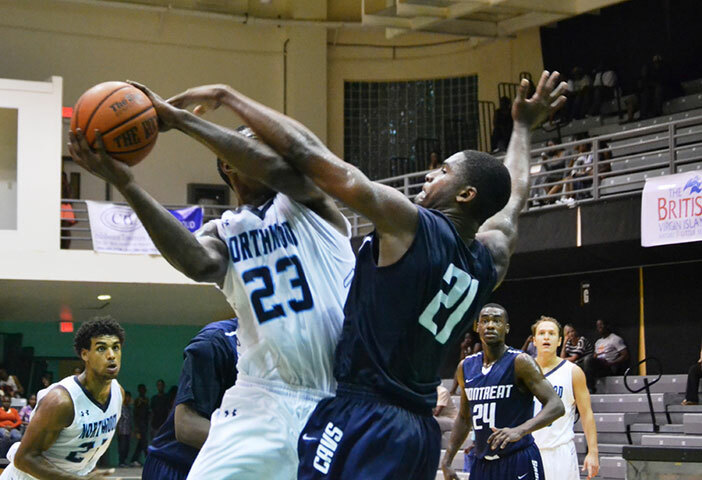 Fred Mattison led three Northwood players in double figures with a game high 20 points to go with seven rebounds and three blocks. Malte Ziegenhagen added 13 points and Chris Solomon chipped in another 12 to the tally. Foster and Shaq Symonette led five Monterat players in double figures with 12 points a piece. Charles Perry-Smith followed up with 11 points. Irvin and Marshall who came off the bench again for 16 minutes work, had 10 points respectively. After spending Saturday on Virgin Gorda touring and taking in the scenery at the Baths, Warner’s Coach Sean Hanrahan gave several of his players who don’t get a lot of playing time, several minutes of play against the 2014 BVI champs Legs. Legs lead 36-33 at the half while Warner controlled the second half 36-28, but fell to the Legs, 69-66. Jevon Serrant led Legs with a game high 22 points. Kitwana Rhymer followed up with 15 and Jason Edwin added 12. Hall was Warner’s top scorer with 11 points. Santiago and Devyn Baranauskas had nine points each.